Arugula is a fast growing, cool season green. It is perfect for the early spring garden and also great for extending the season into fall. Arugula goes by many common names, which get applied to about 20 different species of greens. Almost all of them are in the Brassicaceae or cole crop family. The two most popularly grown types for culinary purposes are 'Wild Arugula'' (Diplotaxisx), the spicy, hot variety, and 'Cultivated Arugula' (Eruca vesicaria), a tamer version. Cultivated arugula has white flowers and oval leaves, often with a wavy serration. Diplotaxisx tenuifolia - an extremely strong and pungent green with deeply serrated leaves. Diplotaxisx integrifolia - a traditional Italian favorite that is also known as ‘Olive Leaf.’ It has smooth, elongated, paler green leaves and a less pungent flavor. Arugula is one of those vegetables people either love or hate. It tends to have a musky odor and taste that can put off some people, while others find its peppery bite very refreshing. Don't feel bad if you aren't fond of arugula; you are in good company. Julia Child loathed it. As long as the temperatures stay cool, full sun is the best exposure. As the weather warms, it appreciates partial shade, especially in the afternoon. Arugula is an annual. It will bolt to seed when the temperatures rise. Height: 6 to 12 in. (Flower stalks may reach 2 to 3 ft.) Spread: 12 to 18 in. You can start harvesting baby leaves in about 21 days. For full-sized heads, most varieties take about 40 days. Soil: A neutral soil pH of 6.0 to 6.8. is best, but arugula will grow almost anywhere. Arugula is fast growing, and a soil rich in organic matter will produce lots of leaves. Sowing: You can find seedlings of arugula, but it is usually started from seed. You can start seed indoors, 4 to 6 weeks before your last frost date, but arugula seed can handle chilly soil, and you might want to wait and direct seed 1 to 2 weeks before your last frost date. Succession plant a new batch every couple of weeks, to prolong your harvest and take advantage of its short season. Although arugula likes cool weather, it can be damaged or stressed by frost or snow. Keep the row covers handy and protect your plants if extreme weather is predicted. Gardeners in USDA Zones 8 and up will have better luck with fall sowings, succession sowing into winter. Even cool season gardeners can start seed in late summer, to harvest up until frost. The seeds are small and should barely be covered with soil. Sprinkle them on dampened soil or potting mix and press firmly. Then dust with some more soil and keep moist. They should germinate within 2 weeks. Arugula is shallow rooted and makes a good choice for growing in containers. You'll have more control over sun exposure in a container, but they will dry out more quickly. 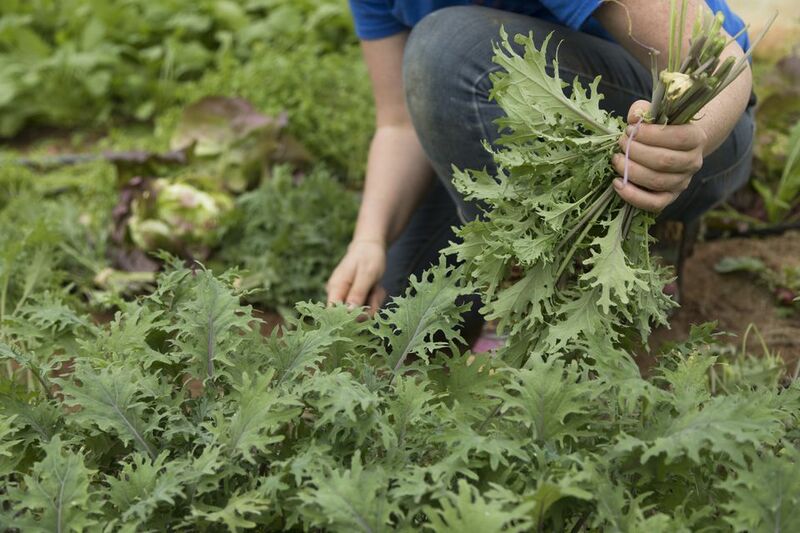 The biggest maintenance chore is keeping your arugula well watered. Regular water will keep plants from bolting too quickly. If you are surprised with a sudden heat wave, try to shade the plants, in addition to keeping them watered. Plant later seedings in the shade of taller plants, like tomatoes and beans. Many arugula varieties are self-sterile and need insects for cross-pollination. They do not cross with other Brassicas, so you can save seed for planting next season. Being a Brassica, arugula has a host of pests that love it. Luckily it has a short growing season, and it is out of the garden by the time the insects start flying in. Slugs do the most damage in my garden but be on the lookout for eggs of cabbage worms, cabbage loopers, and the diamondback moth, as well as aphids and flea beetles. You can start harvesting young leaves when they are about 3 in. long. Harvest just a few outer leaves, as a cut and come again variety, and allow the rosette to continue growing. Mature plants can be harvested as a head, just above the soil line. Depending on the weather, they may re-sprout and fill back in. Once the plants send up flower stalks, the leaves tend to turn bitter. Don't be too quick to yank out the plants. The flowers pack a lot of flavor without the heat of the leaves. Young leaves are very tender and are best eaten fresh, in salads or on sandwiches. Older leaves are also great fresh, and they make nice additions to stir-fries, egg dishes or soups. They should be added toward the end of cooking. The fragile flowers can be tossed on top of salads or soups, sprinkled on sandwiches, even added to drinks.